Plant: perennial herb; BULBS 1-3 cm long Leaves: LEAVES 6-24 cm tall; leaflets 5-11, 10-72 mm long, 2-40 mm wide INFLORESCENCE: 5-12-flowered; pedicels less than 30 mm long Flowers: perfect, the petals clawed, connate at base; stamens 10; pistil 5-carpelled; styles 5, corollas purplish, pink, or lavender, 7-22 mm long Fruit: FRUITS fleshy explosive capsules, ellipsoid, 3-11 mm long. SEEDS 0.8-1.2 mm long, arillate Misc: Coniferous, oak, or mixed deciduous forests, sometimes scrubland or grassland; occasionally weedy; 1700-3200 m (5000-9500 ft); Jul-Sep REFERENCES: Denton, Melinda. 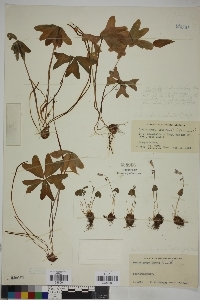 1998 Oxalidaceae. J. Ariz. - Nev. Acad. Sci. 30(2): 115.